In the recent years many articles, including Journal, Art Review, General Reviews in Art, Book, Photos and Videos on Wiki Loves Africa, Social Media, and has positively influences the affiliate marketing programs network online through the Creative Arts Solution Foundation blogger worldwide. He completed his graduation in Yaba College of Technology 2000-2003 and later proceeded to the department of Creative Arts at the University of Lagos in 2007-2009, as he was interested in Visual art, he started taking part in group art exhibitions as at the of level an apprentice under late A. Shyngle. 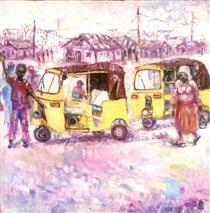 Later on he launched his first solo exhibition theme:Vision on 30th Nov-Dec 6th 2007 at National Gallery of Art, Lagos. Born on (Jan 24, 1974) Heals from Lagos State (Agbowa Ikosi). He started his career at Cathedral Pry Sch 1982-1988.Boy's Academy Secondary Sch, Lagos island, Yaba College of Technology, University of Lagos. 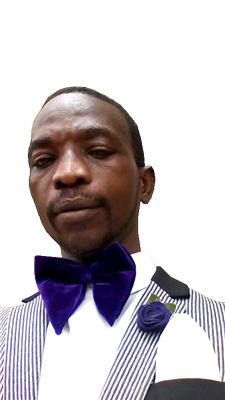 Ayibiowu, initially as a studio Artist known as Solart Studios Ent and Art Creative Solutions but Later launched Creative Arts Solution Foundation of which is the President/Chairman. The foundation is a Non-Governmental Foundation formed in Dec 10, 2012. It aims to encourage the young people as well as old ones grow in art and others professional field, thereby giving opportunities to gain skills, in vocational works while increasing public awareness and its benefits to society. Later on he also shows is use of photography and its originality as it breaks free of conventional unities of body, space and time and contribute skillfully to edits in video, computer engineer, music as well as dance drama through presentation in an events and occasion. 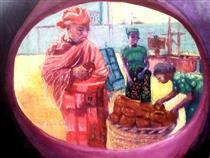 He was Commissioned to produced Paintings for the Baklang Consultants in 2006 just/Donations to mention a few company. Celebrating Africa's Music and Dance on Wikipedia ! This file is licensed under the Creative Commons Attribution-Share Alike 4.0 International license.WIKI LOVES AFRICA 2016 Olusola David, Ayibiowu who's works of art has been showcase on a particular well known TV Station programmed on Channels TV Art House. The Presenter and Producer Melinda Akinlami was present over the years during the one man exhibition. The Producers' Showcase went on the air. Also one of the painting could be located in their office. 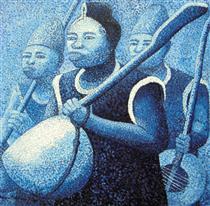 Also contributed his biography on WikiArt as Olusola David, Ayibiowu. Contributing to Care2 by signing petitions for others who need help by name Olusola David, Ayibiowu. Since Jan 1, 2018 signed petitions up to 35 and more. · 2007 || ''National Art Exhibition'' || Democrat Artists United for Democracy ||Oil on canvas. 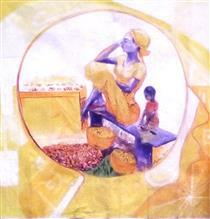 · 2007 || ''First Solo Art Exhibition'' || Vision ||Oil on canvas, water colour, etc. · 2009 || ''National Art Exhibition'' || Open House ||Oil on canvas, water colour, etc. 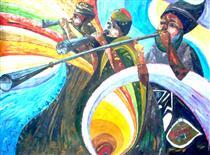 · 2010 || ''Group Art Exhibition'' || Art Creative Solutions ||Oil on canvas, water colour, etc. · 2011 || ''Solo Art Exhibition'' || Purpose ||Oil on canvas, water colour, etc. · 2012 || ''National Art Exhibition'' || Arts the Vason way ||Oil on canvas, water colour, etc. · 2012 || ''Launching Art Exhibition'' || Creative ||Oil on canvas, water colour, etc.